LANSING — With control of the Michigan House up for grabs, Democrats and Republicans have already poured more than $10 million into 15 districts that will ultimately decide which party wins. Three individual races have surpassed the $1-million mark: the 99th District between Republican Roger Hauck and Democrat Bryan Mielke; the 91st District between Rep Holly Hughes (R-Montague) and former Democratic Rep. Collene Lamonte; and the 61st between Democrat John Fisher and Rep. Brandt Iden (Oshtemo Twp.). To arrive at the numbers, MCFN analyzed fundraising disclosures from the candidates through Nov. 1, reports on independent spending by Super PACs and broadcast TV advertising disclosures. Spending that doesn't have to be disclosed to the Secretary of State on cable TV advertising, mailers and robocalls isn't included. 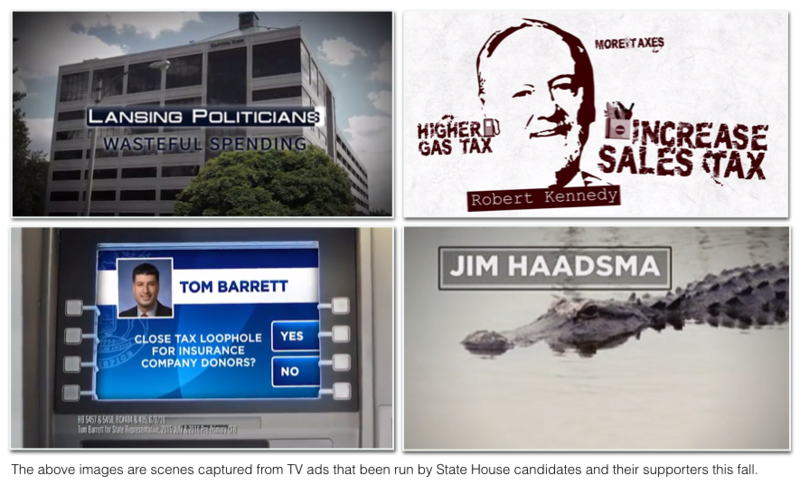 Through Monday, Oct. 31, MCFN tracked $2.6 million in broadcast TV ads aimed at State House races. By scrolling your mouse over map — a project of MCFN and MiDataLabs — you can see who’s been running ads in the district where you live. Of the 15 races MCFN compiled spending totals for, Republicans were spending more than Democrats in nine of them. Democrats were spending more than Republicans in six of them. The following is a summary of where the money stands in the 15 races. They are ranked in order of the amount of documented money that’s flowed to each race. The 99th District has traditionally been held by Republicans, but Democrats have made a major investment in their candidate Bryan Mielke, a Union Twp. trustee. At this point, Democrats have collected more money in the 99th this year than any other Michigan House race. Democrats have invested about $673,314 in the race while Republicans have put in about $417,648 for their candidate, Roger Hauck, who’s also a Union Twp. trustee. Those numbers include the candidates' own fundraising. Through Monday, Oct. 31, Mielke’s campaign had run more than $200,000 in broadcast TV ads. Republicans had aired less than $100,000 in broadcast ads. The 91st District race between Rep. Holly Hughes (R-Montague) and former Rep. Collene Lamonte (D-Montague) falls narrowly behind the 99th in spending. Each side has invested more than $500,000 here. Democrats were at about $537,554. Republicans were at $552,401. Hughes has benefited from a late spending surge by the House Republican Campaign Committee of $100,000 and independent spending by the Business Leaders for Michigan, the Great Lakes Education Project and a group tied to Senate Republicans called Michigan First. Republicans and their supporters have sent more money to the 61st District to try to protect Rep. Brandt Iden (R-Oshtemo Twp) than they’ve sent to any other House District. Iden supporters have poured about $700,000 into Iden's efforts. Democrats have spent about $355,535 to boost their candidate, John Fisher. Outside spenders have also boosted Iden with the Michigan Realtors, the Great Lakes Education Project and Gov. Rick Snyder’s nonprofit Making Government Accountable all spending independently to help Iden. Democrats have out-spent Republicans in the 66th by flowing about $566,754 into this traditionally Republican district. The Democratic candidate is Annie Brown, of South Haven. The House Democratic Fund has dropped $266,194 into the race since Oct. 26. Brown and her supporters have run about $200,000 in broadcast TV ads. Republicans have spent about $383,262 total in support of their candidate, Beth Griffin, of Paw Paw. 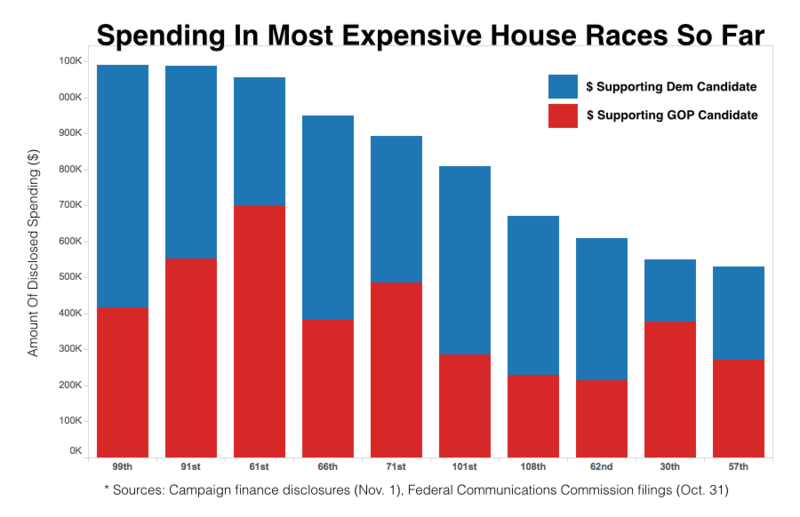 In 2014, the 71st District race was the third most expensive of the 110 Michigan House races. The 2016 rematch between Rep. Tom Barrett (R-Potterville) and former Rep. Theresa Abed (D-Grand Ledge) is shaping up to be an expensive one as well. Republicans have poured about $485,373 into the race while Democrats have spent about $407,623. About $100,000 in independent spending has benefited Barrett in the race: the Michigan Chamber of Commerce ($37,434); the Senate Republicans’ Michigan First ($46,400); and the Great Lakes Education Project ($17,999). The pro-labor Working Michigan PAC spent about $33,969 in support of Abed. The open 101st District is another district where Democrats have spent particularly heavily. Democrats have spent about $522,825 for their candidate, former Rep. Dan Scripps, of Northport. Republican Curt VanderWall, of Ludington, has seen about $286,763 in money flow to his campaign and its benefit. The Michigan Republican Party has run about $78,070 in broadcast ads to help VanderWall, according to filings with the Federal Communications Commission (FCC). Both the Michigan Republican Party and Democrat Scott Celello’s campaign have aired more than $100,000 in broadcast TV ads in the open 108th. Democrats have sent about $440,424 to help Celello, of Iron Mountain, including a late push of $88,476 by the House Democratic Fund. Republicans have provided about $230,680 to help their candidate, Beau LaFave, of Iron Mountain. The battle for the 62nd District has also been playing out on TV screens. Through Monday, Oct. 31, the campaign of Democrat Jim Haadsma, of Battle Creek, had aired about $200,000 in broadcast TV ads, according to MCFN's analysis of Kantar Media data. Rep. John Bizon (R-Battle Creek) and the House Republican Campaign had aired about $141,000 in ads, according to the same data. But Democrats have invested more heavily in the 62nd. Their total so far is $395,311. Republicans have provided about $213,652 for Bizon. Republican Diana Farrington, of Utica, has seen an influx of money to boost her campaign in the 30th, the seat her husband, Jeff, currently holds. Republicans have invested heavily in Farrington’s campaign, to the tune of $377,761 this cycle. Her opponent, Democrat Michael Notte, of Shelby Twp., has benefited from about $171,691 in spending on his side. The campaign of Republican Bob Howey, of Trenton, has seen a $46,183 boost from the House Republican Campaign Committee in the last week. Howey is trying to keep the swing 23rd District in GOP hands against a challenge by Democrat Darrin Camilleri, of Brownstown. Republicans have collected about $234,992 so far for the 23rd District race while Democrats have collected a total of $187,894 for Camilleri. Spending has been more uneven in the 39th District where Rep. Klint Kesto (R-Commerce Twp.) reported raising $288,979 through Oct. 23. In total, about $343,710 has come into the 39th on Kesto’s side. Democrat Michael Stack, of Commerce Twp., has seen about $74,548 in documented spending on his side. 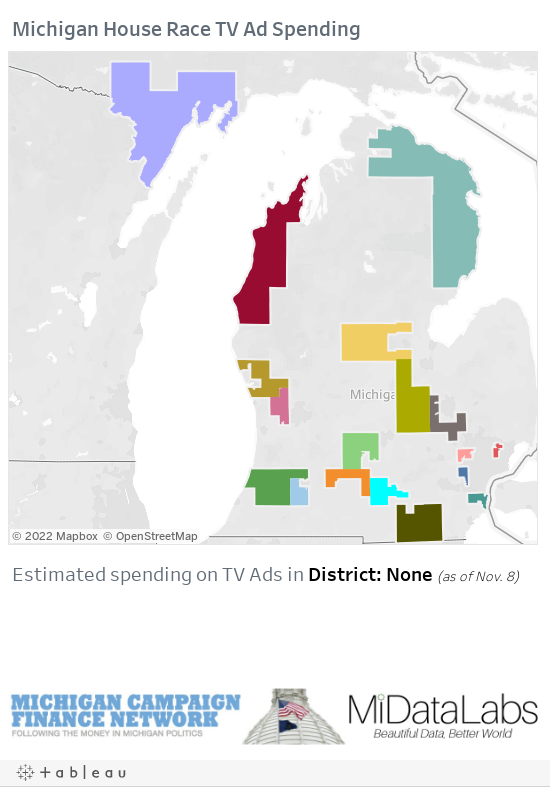 The Michigan Republican Party and the Michigan Democratic Party have both been running broadcast TV ads in the 106th, driving up the spending total there. Across spending methods, Republicans have invested about $234,212 in the 106th for their candidate, Sue Allor, of Wolverine. Democrats have invested about $179,621 for their candidate, Robert Kennedy, of Harrisville. Republicans have dominated disclosed spending in the 56th District, where Rep. Jason Sheppard (R-Temperance) is running for re-election. The district has seen about $311,496 in support of Sheppard while it’s seen about $48,804 in support of Democrat Tom Redmond, of Lambertville. Democrat Dana Camphous-Peterson, of Mt. Clemens, is one of the six Democratic candidates with a money advantage. Her campaign has seen about $202,721 in spending on its side while the campaign of Republican Steve Marino, of Harrison Twp., has seen about $149,834 in spending on its side. Camphous-Peterson benefited from $45,383 in independent spending on paid canvassing by the labor PAC, Working Michigan.